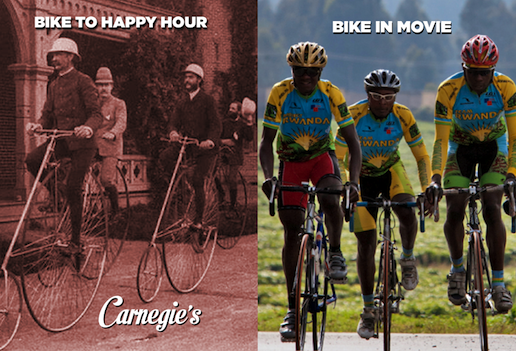 Bike-to-Happy-Hour at Carnegie’s 4:00 – 7:00 p.m. 1600 Oregon Street. Mayor Missy McArthur will share thoughts on the importance of creating a bicycle friendly Redding. Public Works Director, Brian Crane will give a look into upcoming bicycle facilities projects in Redding. We will share Shasta Bike Challenge updates and announce the upcoming opportunity for Bicycle Friendly Business award. Shasta Bike Challenge ends May 21. We are honored to have Rising From Ashes Executive Producer and Team Rawanda Co-Founder, Dan Cooper attend and introduce the film. Generously sponsored by Dignity Health, Enjoy, Healthy Shasta and Carnegie’s. Brought to you by Shasta Living Streets. Rising from Ashes is a remarkable documentary and a story of what happens when people care for each other and their community. In 2006, professional cyclist Jacques “Jock” Boyer moved to Rwanda to help a group of struggling genocide survivors form a cycling organization. All of its members were young children during the genocide, and many were left orphaned. The film follows the cycling organization’s progression into a national team, and the emotional and psychological impacts the cycling team has on both its members and a nation still struggling with the aftermath of trauma. The bicycle advantage, it’s not about the bike. 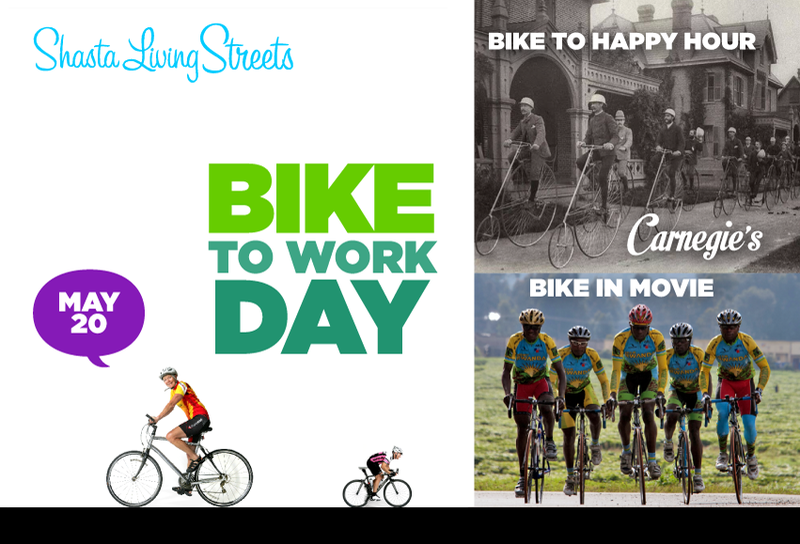 We have an exciting opportunity to build great cities and towns in our region by making bicycling safe, convenient and fun. This is not about thinking bikes are cool and its not about weekend exercise and recreation in our beautiful parks and open spaces. Though those things are good too. Making bicycling safe, convenient and fun for everyday transportation brings tremendous advantages – it allows families to be healthy and save money on transportation, makes more vibrant and connected communities, and supports our local businesses by helping them attract customers, retain talented staff and attract tourists. Bicycling it turns out, is good for all of us whether we bicycle or not, because it’s good for local business and the strength of our community. Bike and walk safely in Downtown Redding. It’s not recreation, It’s life!